Can you provide the link to where you purchased it? Want to put one on my E550. I thought you had Distronic? In which case the Star is not replaceable. I wanted Distronic, but sadly that was the one option my car didn't come with. Got it, so you are good to go. It is a great option, however! Liked it so much I have one in white light one in Blue Light and one in Red light. I have them on quick disconnects. Takes about 10 sec to swap out. I usually just drive with the blue one in. I think I like it the best. Yours looks great Now you need to install an AOOGHA Horn. Told my neighbor I got my E400 from Amazon. This should be a required accessory. At least MB should start offering it as an option when ordering. I think it's funny the neighbor went out and got it from the dealer and paid $500. Now OP can't tell them the truth about what he paid or they might be pissed. Maybe the neighbor is lying - they got it off ebay and didn't want to hurt OP's feelings because they think he spent $450 more than them. If my neighbors ask me about something I did for my car, house, etc., I tell them how much I paid, how to save money on it, etc. even if they don't ask. I usually offer to help them do something if it is a simple DIY project, but rarely do they take me up on it. And they hardly ever reciprocate or tell me what they ended up doing. If they decide to spend more money on the same thing, that's up to them - it's their money. You'd think I would be considered a good neighbor but they probably think I am weird or cheap. Doesn't matter - most end up moving anyway thanks to divorce or work. I am always doing something for the neighbors. But they reciprocate. If I ever need anything done they come over immediately. I finished one neighbors basement for free. He supplied the material and I worked there for a month and I finished it for him. For the past 14 years my neighbors have not had to shovel there driveways. I have a tractor that has a cab and a heater and it throws the snow 30 feet away. I do about 5 driveways every time it snows. In return they shovel my sidewalk and stairs. They come home from work and there driveways are done. We help each other. That's the way it should be. The last two neighborhoods we've been in were fairly transient. We've lived in our house for over 6 years and in that time 12 of the 18 other homes on our street have turned over, some more than once. Wow that is unbelievable. It is always good to have good neighbors. Only One guy on our block is an idiot and he speaks broken English. No one talks to him. He is the guy that calls the building Dept and tells them you are doing work without a permit. My street has mostly been the same people for like the past 20 years, maybe like 3 houses changed occupants. They all bunch of snob! Just because they drive Mercedes Benz and BMW they think the are better than other. I said Hi! to them when we moved into the neighbor and they ignored me and my family. One of them almost run over my kid for playing in front of our own garage and he got the nerve to yell at my little boy for playing outside, I wanted to kick his *** so badly! lucky for him my wife said let it go and be good neighbor. This was one of the guy that ask me about the Star. They to cheap to take their cars to MB for service. When they saw me working on my car they come up to me and ask me if I know how to change the oil, engine filter..cabin filter. I was nice enough to show them how to but I'm not going do it for them. 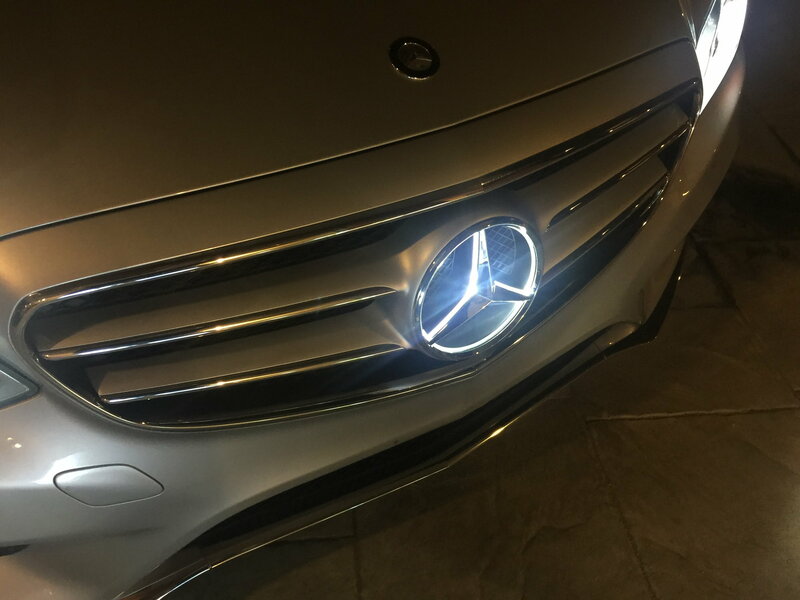 I was at my dealership today to pick up a new rear license plate bracket, and right there on the parts counter is an illuminated MB star with advertising to have one installed on your car. I asked the parts guy how much it costs.... $699. It's a piece of plastic for crying out loud. But considering the plastic license plate mounting plate cost $75, I'm not surprised. I just ordered the LED Star from the link you shared. Thanks. Please post a quick description of how exactly you wired it to your vehicle. 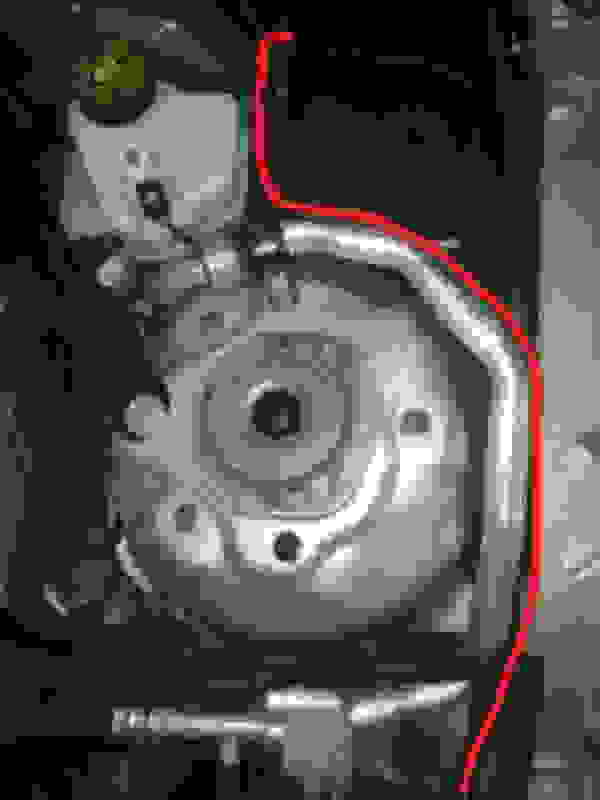 After your install, does the star light up once the ignition is turned on? Last edited by Tump43; 08-28-2017 at 08:01 PM. 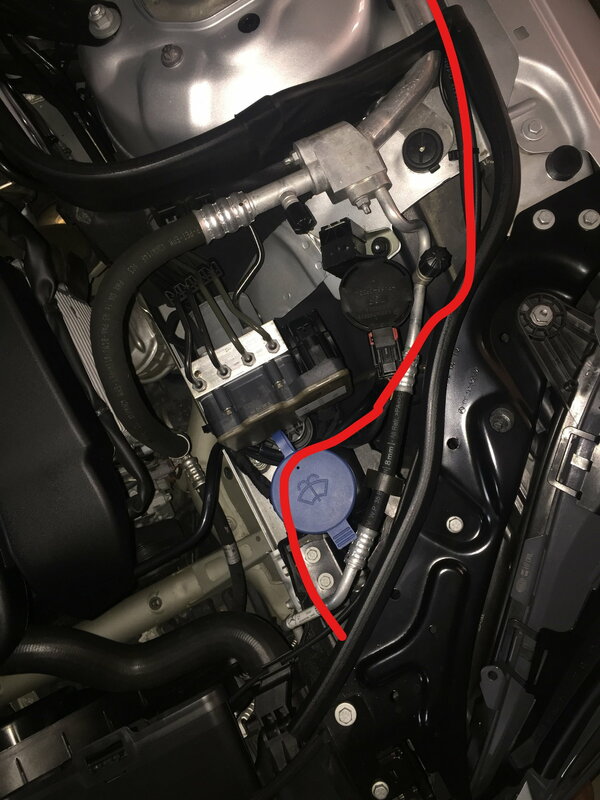 any one have instruction to connect wire for 2014 E350? My arrived 9 days after paying included one weekend. Installation is very easy. I can take some pictures to show where to route the wire and which fuse to tap into if you like. The guys from the link above got the right ideas but I don't like their wiring job. They got their wire showing, pinched and the fuse tap..that just so sloppy. You can't find my wiring even if you open the fuse box you won't know anything been tamper with. I guess I'm just picky. 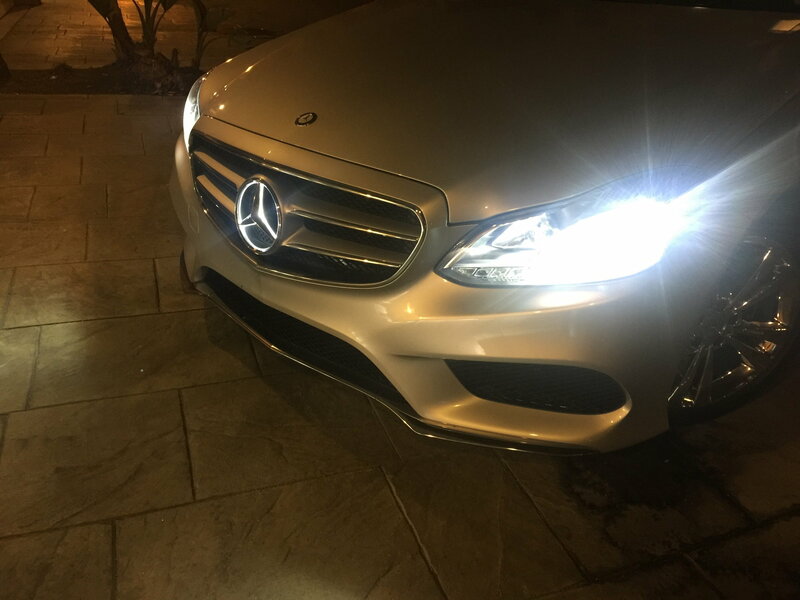 btw.. if you tap it into fuse number 24 (15AMP) (I try #23 but it come on and off a few extra time before it turn completely off) #24 turn the illuminated star on when you lock or unlock with key fob. open any of the doors, trunk or hood. also on full time when the engine is running. It will turn off about 30 sec later when you undo the above. Thanks, I would really appreciate a couple of pictures and some comments. I ordered a fuse tap but would rather install per your pic's and instructions. I'm a bit fussy about my car as well. Thanks for being meticulous -- it's the only way to go!! If you get the same kit as I did the harness is about 20" short of reaching the fuse box. Get yourself about 20" of 18awg red/black wire and extend it. I would wraps the whole harness with electric tape just to protect it. Once you're happy with your wire run Tie wrap it to existing harnesses etc. 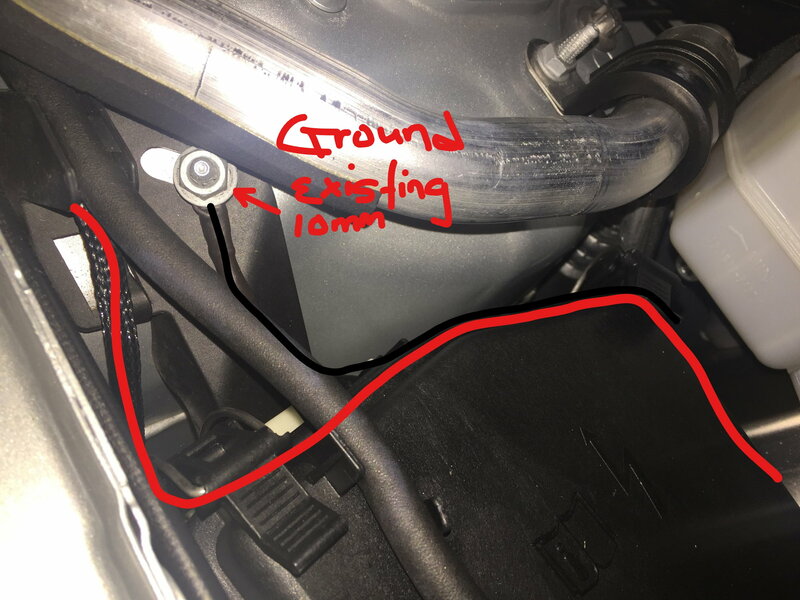 You will need a 3/8 ring terminal for the ground. 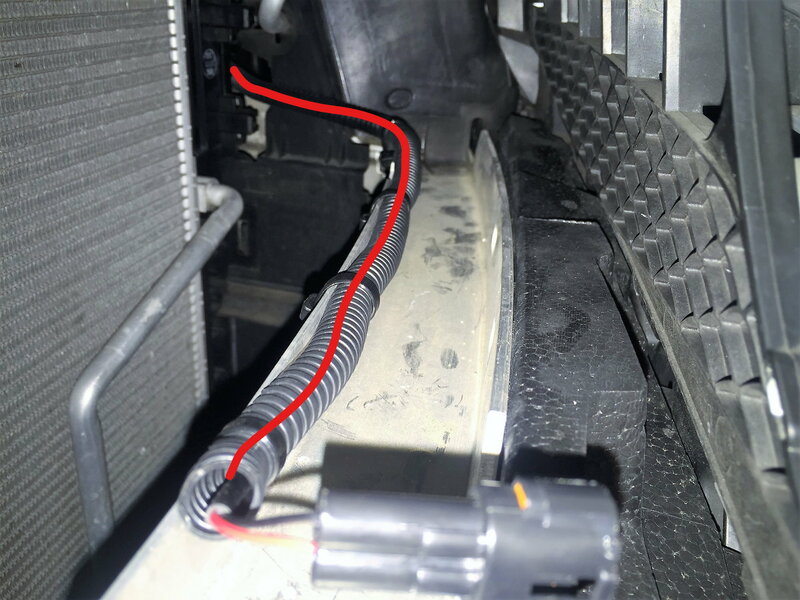 I also use a wire loom that I happen to have lying around to protect the harness behind the grill to the side into the engine bay. There no one way to route your wire. I try to hide my wire and blend in with other harness as much as possible for a clean look. See pictures for routing. if you have any questions let me know. Peter, I understand all your directions with the exception of the last photo. 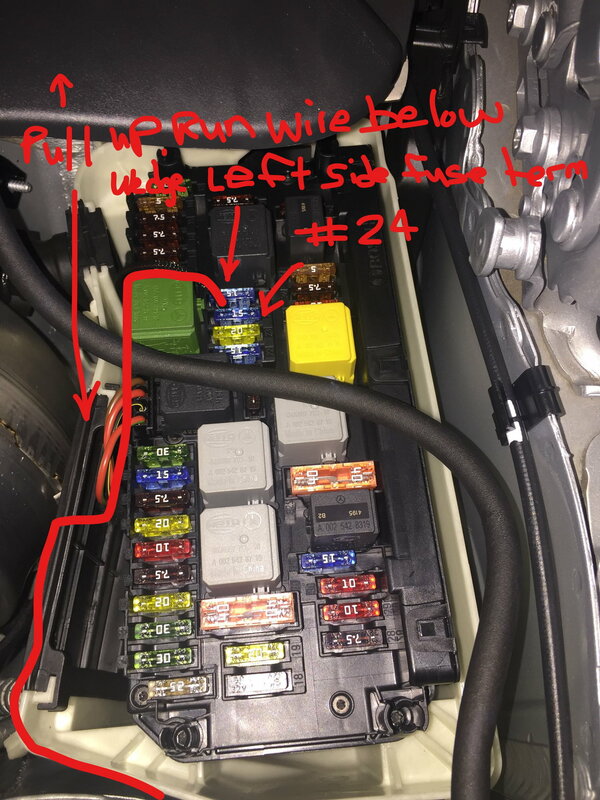 Are you saying wrap the bare red wire around the left blade of fuse located in slot #24? Why not use a fuse tap like the member did in this post? Let me know, placing my order tonight for the illuminated star. You do not wrap around the fuse blade if you do I don't think you can put the fuse back in..place it below the blade and wedge it down when you press the fuse down on it. You can use the fuse tap but it look so messy with it. I just use the existing 15A fuse to protect the star wire. Last edited by Peter_02AMG; 08-31-2017 at 03:55 PM.